On Monday I had a new paper published in a special issue of The Journal of Parliamentary History and has been edited by the amazing Dr John Cooper and Dr Richard Gaunt . The paper discusses some of the work we’ve been doing on the acoustics of the historic House of Commons. 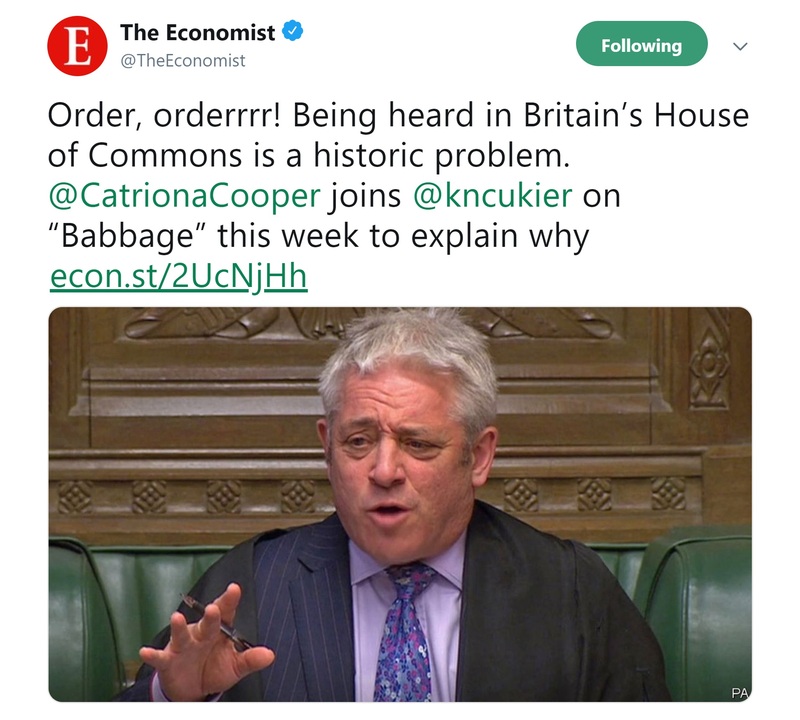 Probably due to the somewhat (understatement) chaotic nature of British politics at the moment it was picked up by The Economist to feature on their Science and Technology podcast. So if you want to hear me talk and can sit through a 30 second advert jump to 16.30. We all know job hunting is miserable. Filling out job applications forms with the same information for different institutions, carefully crafting covering letters, tweaking CVs. Then there’s the short lift of pressing send before the agonising wait to hear back. The depressing emails telling you you haven’t been shortlisted, or the funding bid hasn’t come through. It’s all a bit sad. I want to highlight a few things that I think could make the process slightly less emotionally draining for candidates. I have after a month of unemployment I have landed some more post doctoral work, I had started to apply for roles in May 2018 as the post I was in was coming to an end and really started applying in earnest from July. A very short teaching contract in October saved my bacon, but the first half of December I was losing the drive to keep applying. During this period I was shortlisted for four academic roles, one job I applied for disappeared, I wasn’t shortlisted for four or five more, I also interviewed for two commercial role (one of which offered me a job), and I didn’t get shortlisted for some other types of job. These points aren’t meant to be about me bemoaning my lack of employment but a few points that I think could make the process slightly better. Obviously nothing is going to remove the sadness and not getting a job but I think we could all be a bit kinder. Send out rejection emails when you shortlist. Most of the systems are automatic and given that shortlisting happens quickly there is no need to wait over four weeks to let a candidate know they are unsuccessful. Let short listed candidates know as soon as possible that they have not been successful. The most positive post-interview experience I had (other than getting a job) was being called on the day of the interview to tell me I had not been successful. The worst experience was waiting over two weeks, which included a number of follow-up phone calls, to confirm I had not been successful. If you are interviewed your emotions do run very high until you hear back. The sooner you know the easier it is to deal with the stress. I also believe that its polite to call shortlisted candidates, I know it takes time but usually there aren’t very many people on the list and it does make you feel a tiny bit valued. If not a personal email. Given the candidates have often travelled a distance and at their own expense I would consider this a courtesy. If you are interviewing via Skype check that all parties can be heard and understood. One interview I attended involved a panel spread across three locations with multiple interviewers in one location and the microphones did not pick up one of the voices very well. Interviews are high stress environments this adds to that stress. Linked point, check the tech works or you know how to use it. For example screen sharing. If you are asking candidates to give a presentation make sure you are consistent with the brief. A mini lecture to students and staff is not the same as presenting to a room full of predominantly male academics who are all significantly more experienced than you. Linked point: gender balanced panels are helpful. Make sure the directions you provide are accurate and up-to-date. Possibly more relevant to commercial companies but if you are interviewing a candidate for a permanent post its pretty mean to offer them a fixed term contract instead without any discussion of the changing role. I refuse to believe that any of the jobs I applied for were offered to internal or preferred candidates on anything other than the candidates own performance at interview or superior experience. Though if your shortlisting someone with significantly less experience you should question why you’re doing so. Actually I draw on Ingold’s work quite heavily, and don’t want this to be a criticism of that in anyway. The title of this blog is based on a response myself and a friend and colleague reached towards the end of a long conference. Our complaint revolved around the male dominance in the work being cited. And at this conference Ingold could have won you key word bingo. I mostly work in two fields which are generally considered to be male dominated; Digital Archaeology and Castle Studies. During a Castle thing I pointed out that all the current experts the group called on were male, and was told that that was the nature of the discipline. A rather wonderful thread on twitter points to this being incorrect. While Digital Archaeology I think has a bad recent history, at least CAA have taken a strong approach to combating this stereotype. Recent work has suggested men tend to get cited a lot more. In fact not only do men tend to cite themselves more we also know that women in general tend to be cited less. We have seen they tend to dominate departmental seminar series, and then there is “manels”. This has been a subject on the rise in recent months with various people asking if any journals have any guidelines that encourage a diverse bibliography. I also understand that presenting appropriately diverse reading lists has also been under discussion in the History department at York. But I’m not sure I have seen a formal way to move forward. I was recently asked to peer review a paper for the SPMA. While going through it I was surprised to note a couple of (female) authors I was expecting to feature were not present. It struck me that actually I had no idea how diverse the bibliography was as first names were shortened to initials. I realised my working practise had to change and spent a painstaking hour googleing citations trying to predict gender (though this methodology isn’t concrete a better working practise is discussed here), until I was satisfied that there were enough women featured within this list. I also pointed out in my comments that the papers I was expecting to see weren’t cited. This might not change the world. I know that me taking the extra time to explore this within a single paper context might not seem like it would change the world. However, we should be critically reflecting on who we are citing, and further who other people are citing as part of our review process. If the trends mentioned above continue in an academic world focused on h-index’s and Impact, then the current bias observed in senior university roles will continue. It’s the morning after International Women’s Day and I want to take a few moments to reflect. In 2016 and 2017 I spent time preparing blogs celebrating my colleagues and women who led the way in my field. I could be writing about the “Women of the Ventilator” who choose to carve out a space in the House of Commons. I could be writing about my incredible colleagues in archaeology, the Audiolab, History, or commercial archaeology. I could celebrate the achievements of my friends who have done amazing things this year; securing jobs at 30 weeks pregnant, escaping controlling relationships, forcing change in government policy to name a few. I should be celebrating the these things, reflecting on the drive towards social change this year seeing #metoo #timesup the calling out of manels, the gender pay gap. I come from a privileged background, there is no escaping the fact I’m a white middle class woman with the “right” accent. Not only this I was also raised with a strong belief that I could pursue any career I choose and my gender would not hold me back. This came from both my home life; a mother who worked as a computer programmer, a grandmother who taught maths, GP’s, PhD’s to name a few. But also my school, yes the local comprehensive, which while not offering particularly helpful career advice did not put forward any suggestions that I should or should not follow any particular road. But this year I’m struggling. For the first time, at age 29, I’m really struggling. For the first time someone has directly suggested that the combination of my age and gender would mean they wouldn’t employ me. For the first time I feel my own agency has been taken away and my body is being policed. Because at 29, recently married, I’m high risk because I *might* want to start a family. 2018 is about believing that what i’m doing is the right thing and that change will happen. I need to renew my energy for the fight, because i’m struggling to see progress at the moment and we need to see those changes. I need to believe that what i’m doing now will lead to a career and I will not be sidelined because of my body or gender. My PhD was conceived to bring together a range of different approaches and methodologies towards the study of late medieval buildings. It started as one of two PhDs myself based in archaeological computing and a second student with a background in medieval history. This intended to bring together digital visualisation techniques with a solid base in evidence sourced through archival research. I have stated elsewhere how visualisation techniques have been highly critiqued and the methodology developed to work in an archaeological context. There are courses that can be sat on to teach the tools available and how they can be applied in archaeology. However, for Auralization this is not the case, there have been limited applications in archaeology and the technique still requires a deep understanding of acoustical engineering. Working with ISVR has been challenging, it took us a long time to find someone to work with who could teach me how to do acoustical survey and how it can be applied. Engineers work in different ways and focus on different things. In reverse they do not have the theoretical background in archaeology to engage with the results of the work. Where I am going with this is that using techniques from other disciplines (even just history) can be incredibly challenging. It is not just finding the contacts and someone interested in working with you. It is knowing what techniques can be used and their limitations to apply them correctly. It is making sure you are asking the right questions when learning techniques to ensure you are getting the correct answers from your collaborators not just the easy answer. However, I have found other aspects of multidisciplinary method more frustrating, particularly when presenting my work. These issues can be as simple as struggling with referencing; archival sources such as illuminated manuscripts are very difficult to reference using the Harvard system. I spoke to Prof. Chris Woolgar from history who said, that in essence, you have to “bodge” it. Not something that works well with bibliographic software. The same is true in engineering working to disciplinary standards, trying to find the best way of getting the information across feels impossible at times. Presenting the results of sound work is also frustrating, rarely are conference venues setup with good quality audio, if any at all. I find it hard to reconcile myself to discussing the experience of sound without any audio accompaniment in the same way discussing visualisation without images seems ridiculous. This continues when writing my thesis, providing a mechanism for the sounds I am talking about to be heard. I don’t mean for this blog post to be a rant, I was hoping instead to highlight some of the difficulties in working between disciplines for all multi-disciplinary research in general. As we are being encouraged to use methodologies from other disciplines, I hope the more this is embraced the easier it will get for some of these basic problems.